An utility bicycle, city bicycle, urban bicycle, European City Bike (ECB), classic bike or simply city-bike, is a bicycle designed for frequent short, moderately paced rides through relatively flat urban areas. It is a form of utility bicycle commonly seen around the world, built to facilitate everyday riding in normal clothes in a variety of weather conditions. It is therefore a bicycle designed for practical transportation, as opposed to those primarily for recreation and competition, such as touring bicycles, racing bicycles, and mountain bicycles. Utility bicycles are the most common form globally, and comprise the vast majority found in the developing world. City bikes may be individually owned or operated as part of a public bike sharing scheme. Generally as they are more suitable for urban environments, they focus more on comfort and practicality instead of speed or efficiency. They normally have a slightly curved, roughly planar aligned and elevated handlebar, providing users an upright sitting position. They have fewer gears and they often are heavier than road bicycles. They might have the top central frame bar diagonally aligned for allowing easy mounting in and out and they might have a back or front frame for transport of items. The saddle is typically larger compared with other bicycles and the majority are provided with chain and tire protection against oil or dirt. Bicycles have been promoted for their utilitarian strengths since before they were technically known as bicycles. The draisine and the boneshaker were hoped to become an inexpensive utilitarian alternative to horses by their makers. However the inherent danger, cost, discomfort, and restrictive gender roles of the day, kept it popular mainly with wealthy adventurous young men, and mainly for recreation and sport. The development of penny-farthing moved away from the utilitarian goal of earlier forms, with its less stable ride, and difficulty carrying much baggage. It furthered the trend of bicycles to be used by young men, willing to take risks, for sport and recreation. Despite this, we find the earliest mention of working bikes in 1874, in Paris, as couriers, for a newspaper and the stock market riding penny-farthings. It was the introduction of the safety bicycle that was successful for the first time to build a bicycle that worked well for utilitarian purposes, "a poor man's nag". It was this development that was the cause of the bicycle boom of the 1890s. The main use of bicycles during the boom was still sport and recreation, but additionally they were adopted by many professions such as police, postal workers, delivery men, municipal workers and for basic transportation of people of all classes, races, and genders. In the USA, after the boom, use changed dramatically from sport and recreation to basic transportation. By 1902, as the boom was coming to an end, nearly all cyclists were cycling for practical purposes. The price of bicycles dropped dramatically, due to increased competition between makers and more price conscious consumers; profits dried up and many of the cycling manufacturers went out of business. The history is similar in the UK, but there some of the manufacturers were better able to handle the transition to transportation based cycling, even to the point of talking of a second boom due to so many working-class people taking up cycling. Additionally the British makers were able to tap into the developing markets overseas, primarily India, China, and Japan. In countries like the USA, the use of utility bicycles all but disappeared until after the Second World War, when a few British and Italian roadster-type bicycles saw a brief upsurge in popularity. Since the Second World War, utility bicycles have remained popular in countries like the Netherlands, China, and much of the developing world. Since the 1890s only incremental mechanical advances have taken place for the majority of the world's utility bicycles. In fact many bicycles in Asia still employ rod brakes. One exception to this was the continued development of substitute propulsion systems for utility bicycles in the form of add-on gasoline engines and transmissions. Developed shortly after 1900 in Europe and the United States, motorized utility bicycles surged in popularity in Western Europe after the Second World War. Typically, a small one or two-horsepower, two-cycle engine was fitted with a tire roller-drive mechanism that would convert any standard utility roadster into a motorised bicycle. As they could still be propelled by human power, they were considered as bicycles under most national registration schemes. The motorised utility bicycle or cyclemotor offered greater range, faster commutes, and increased versatility to a large sector of the postwar European consumer market that could not afford expensive automobiles or motorcycles. In 1962, the advent of the Moulton bicycle brought a fresh outlook to the traditional utility concept. Utilizing small, easily transportable frames and wheels as well as suspension, the Moulton was designed to accommodate the increasing public usage of bicycles in concert with other forms of mass transportation. During the 1990s, several bicycle designs were introduced in an attempts to improve on the traditional utility bike. Most of these centered on the use of lightweight frame alloys, new brake and gearing systems, and electronic navigation and monitoring assistance. Deutsche Post delivery bike in Cologne. Utility bicycles are principally used for short-distance commuting, running errands, shopping, leisure or for transporting goods or merchandise. Utility bicycles may also be seen in postal service, in war, and for employee transportation inside large workplaces (factories, warehouses, airports, movie studio lots, etc.). In some countries, entire fleets of utility bicycles may be operated or administered by local or national government agencies as part of a public bike sharing programme. The utility bicycle is the most widely used form of bicycle in many undeveloped parts of the world. While motor vehicles have displaced bicycles for personal transportation in many industrialized and post-industrial nations, rising fuel costs and concerns over the environment have led many people to once again turn to utility bicycles for a variety of daily tasks. In countries where purpose-built utility bikes are unavailable or unsuited to local conditions, many cyclists have acquired hybrid bicycles, road bicycles, mountain bikes, or touring bicycles for commuting and general utility use, often refurbishing older or secondhand models. A few countries, notably China, India, Netherlands, Denmark and the Flemish Region of Belgium, continue to produce versions of the utility bike. 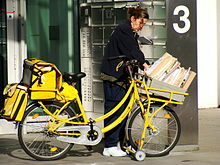 In addition, the Deutsche Post uses a version of a utility bike in most German cities for delivering mail. Utility bicycles often feature a step-through frame so they can be easily mounted, single speed, or with internal hub gearing, and drum brakes to reduce the need for maintenance, mudguards to keep the rider's clothing clean, a chain guard to prevent skirts or loose trousers from being caught in the chain, a skirt guard to prevent a long coat or skirt catching in the rear wheel or brakes, a center stand kickstand so it can be parked easily, and a basket or pannier rack to carry personal possessions or shopping bags. A traditional type of utility bicycle, the English roadster may weigh as much as 35 to 50 pounds (16 – 23 kg). Parts such as frames, wheels/rims, and tires are chosen for strength, safety, and durability rather than high performance. Additionally, utility bikes tend to incorporate fewer technological advances in material design and engineering in comparison to sport bicycles, though there are exceptions. In particular, the small-tired Moulton portable utility cycles incorporate advanced engineering with relatively light weight. Most utility bikes feature an upright riding position. The handlebars are almost always curved back and positioned higher than the saddle so that the rider can operate controls without changing his or her riding posture. Some people add a child seat or a trailer. The utility bike's combination of parts, design, and features provide functionality and comfort at the expense of weight, an adequate compromise when used as originally intended (local commuting and short rides). The Dutch term Stadsfiets is a useful starting point for defining the nature of the design, as it has the full set of features commonly incorporated into an utility bicycle. The Dutch words fiets and stadsfiets mean bicycle and city bicycle, respectively. A stadsfiets is considered to be a fully outfitted European city bike, distinguished by the following typical features: upright riding position, fully enclosed chaincase, skirtguard, O-lock, hub gearing, dynamo hub, manually operated small warning bell, and built-in lights. German and Dutch versions of the European city bike are similar, though there are differences. The English roadster is similar in design, appearance, and intended use. The primary differences are that the continental bicycles tend to have a higher handlebar position for a more upright riding posture, and are more likely to have rod-actuated drum brakes. Because of Great Britain's cultural and trading influence in its former colonies, the roadster can still be seen in local production and use in many countries of the world. A traditional-styled European city bike includes a frame made of low-carbon high-tensile steel, black paint with chromed accessories, an opaque skirtguard, bottle dynamo, simple dynamo-powered lights, and either a single-speed or 3-speed internally geared hub. Contemporary city bikes are increasingly found in many European cities, including Amsterdam and Copenhagen. Dutch and Danish-made city bikes often include such features as a clear skirt guard, colors other than black, aluminum alloy or chromoly steel frame, front suspension fork, suspension seatpost, Hub dynamo, dynamo lighting with motion-and-darkness detection, magnetic lights, a 7- or 8-speed hub, adjustable kickstand, child seats, and a headlight integrated into the front fork. Newer German models, on the other hand, tend to incorporate a less is more philosophy. The suitability and availability of fully outfitted city bikes depends on multiple factors, including local terrain, city density, car traffic, weather, and bicycle infrastructure. Traditional European city bikes are optimized for short-distance, frequent transportation over flat terrain in urban settings. However, such bikes are also used in hilly Switzerland, including Basel and Bern, where 23% and 15% of daily trips are made by bicycle respectively. A fully outfitted European city bike or heavy utility roadster typically weighs 35–50 pounds (16–23 kg), compared with 14–22 pounds (6–10 kg) for the average road racing bike and 22–29 pounds (10–13 kg) for the typical modern mountain bike, touring bicycle, or hybrid city bike, commuter, or cross bike. A steel-frame European city bike with hub gear, chain case, and other features is heavier and more difficult to ride uphill than a road bike. A steel-frame bike is more cumbersome to carry and store, so it might not be the best choice for commuters needing to transport their bicycles on public transportation nor cyclists living or working in upper floor residences. Instead, European city bikes are often locked and stored outside businesses or residences, even during inclement weather. For easier carrying and storage, makers of European city bikes provide features similar to city bikes on folding bicycles. In the Netherlands, many modern city bikes are also available with an aluminum alloy frame, significantly reducing weight to partly overcome the practical difficulties with a heavier bike. In the United States, Americans living in cities or suburbs with many days of sunshine per year have traditionally used road racing bicycles, sport/touring bicycles, or mountain bikes for general commuting or utility purposes. For all-weather use, U.S. buyers tend to purchase substantially lighter machines than the traditional Stadsfiets or utility roadster, instead choosing hybrid city bikes or commuter bikes derived from road or mountain designs. The latter frequently employ lightweight frames and wide gear ranges for use on higher-speed roadways as well as steep terrain. To save weight, some hybrid city or commuter bikes do not usually possess many accessories, adding only fenders, a rack, and perhaps a partial chainguard, as well as front and rear lights. Their smaller bulk and lighter weight often permits them to be carried into offices and residences, an advantage in countries with extremely high rates of bicycle vandalism and theft (even of older or obsolete models with little monetary value). Most European city bikes are designed to withstand year-round outdoor storage, even in frigid Scandinavia where daily bike usage remains high year-round. Thus, European city bikes need not always be brought indoors and can be left outside, properly locked. To deter theft and vandalism, the European city bike has a tougher frame, non-quick-release seat and wheels, and a rear-wheel lock. To prevent theft or vandalism, it is ideal to bring the bike indoors, but this isn't always possible in dense cities with compact living quarters. The lightweight European city bike is a popular model for Dutch brands such as Batavus and Gazelle, where high levels of bicycle use result in demand for higher performance city bicycles, which is otherwise similar to the fully outfitted typical European city bike. This is sometimes marketed as a "sports" variant of the latter. A city bike with a step-through frame is practical for easy mounting in and out. Straight sitting position focusing on comfort instead of speed. Chainguard and mudguards protect against oil or dirt. Backpack for the transport of items. A hub gear is an important feature of a European city bike. A hub gear system provides greater ease-of-use than a derailleur system due to the ability to change gear stationery, smooth changes, the ability to provide a wide range of ratios, and the requirement of little maintenance. A geared hub requires only one shifter rather than two, thus is easier to use than the pair of derailleurs which provide a greater number of speeds to sporting bicycles that need them. A European city bike or roadster typically has 3, 5, 7, 8 or 11 speeds. In a few high-end models, a Rohloff 14-speed geared hub is available. Batavus makes several models of full-featured city bikes that have a NuVinci hub with continuously variable drive ratio. The NuVinci has nearly the same range as an 8-speed hub (around 300%), selectable at any ratio within the range. With most bikes, the bicycle gearing may be scaled up or down as needed, for example by installing a smaller chainring in front and/or larger sprocket in back to facilitate climbing. Hub gearing permits the use of a fully enclosed chaincase, which minimizes the need for maintenance. A hub gear has lower efficiency than a clean, properly adjusted derailleur system, but retains its efficiency without conscientious cleaning and adjustment. A hub gear system is heavier than a derailleur system. In a hub gear system, the main moving parts are enclosed, making repair more difficult than with a derailleur system. If a geared hub fails, it is sometimes more economical to replace the hub than attempt to repair it. The angled-back handlebars (woman at the frontal plane) allow an erect sitting position increasing comfort, in contrast with straight handlebars (man on the backward plane) which increase tensions on the lumbar area and shoulders. A European city bike has angled-back handlebars and an upright riding position. The handlebars, similar to the North Road style handlebars, have a moderate rise and are swept back toward the body, enabling a fully upright posture similar to a person walking. The rider is easily visible to other traffic and can easily see traffic and hazards. The handlebar's shape allows shopping bags, locks, and other items to be hung from the bars without slipping off. This reduces steering control, but that is compensated by the more stable geometry of the frame and forks. A curved fork and angled vertical tubing provides stable, non-twitchy steering, enabling the rider to ride with one hand, while freeing the other hand for signalling or to secure a load on the rear rack. Europeans commonly use the free hand to hold an umbrella or cell phone, or to hold the shoulder of a child riding their own bike, to train the child for positioning on the road. A coaster brake further enables such one-handed riding, because the one hand on the handlebar only has to steer, not also brake. A stable European city bike enables securely travelling along in a position that is as upright as walking; it feels stable and relaxed, like walking very fast. A safe city bike needs to be capable of easily turning without falling over, and needs to be capable of moving reliably with shopping bags and a lock hanging from the handlebars. A hub dynamo enables a built-in lighting system without the loud noise and high drag of a bottle (sidewall) dynamo, and without the unreliability, high cost, ecological disposal problem, and maintenance inherent with batteries. The hub dynamo powers LED or halogen front and rear lights. The lights have a built-in reflector. The taillight is mounted cleanly on the rear rack or fender. A built-in reflector in the headlight and taillight surrounds or is adjacent to the LED or light bulb. Built-in lights stay on point, i.e., need no adjustments. The latest systems include a capacitor-powered standlight, powered for a few minutes by a capacitor. This prevents the lights from going out as soon as the bike speed drops to less than a few miles per hour; this evens out the amount of light at various speeds, sustaining the light at lower speeds. The latest systems include automatic switching based on darkness+motion detection. This prevents having to reach to physically position a bottle dynamo or consume set-up time; this enables ready, guaranteed lighting regardless of the daylight conditions. A three-position switch has positions for Off, On, and Auto. A hub dynamo prevents the usage-overhead and preparation time of attaching the headlight and taillight to the bike prior to using the bike, and prevents having to remove the headlight and taillight and carry them while the bicycle is parked in public. A built-in light system avoids a failing battery lamp and prevents getting a ticket and fine from having no lights at night. Many Danish bikes feature lights powered through electromagnetic induction. The lights are mounted on the bike wheels, eliminating the need for batteries while incurring less resistance to the rider than traditional dynamos. A front suspension fork is common on high-end, contemporary-styled European city bikes. This is often a coil/oil or air/oil suspension fork with adjustable compression and rebound. A traditional roadster has no front suspension, or a spring-based front suspension that has more limited travel and adjustability. Some high-end models integrate the headlight into the front fork and fender assembly. This discourages vandalism, protects the wiring, and reduces the number of external wires and cables. A built-in O-lock is a type of bicycle lock that prevents ride-off theft, establishes ownership, secures the back wheel to the frame (which can be separately locked), and provides a lock and slot for a cable. An O-lock is also called a ring lock or wheel lock. The O-lock facilitates outdoor parking, by reducing the risk that someone can steal the bike by quickly riding off on it. An O-lock is lightweight and unobtrusive. It can be locked very quickly and conveniently, such as when parking the bike outside a store while running errands. The O-lock also serves as a deterrent to ownership disputes, as the person who has the O-lock key is proven to be the owner of the bike. More recent O-locks have a slot to attach an armored cable, allowing a cyclist to lock the frame, wheels, and seat. O-locks provide a limited degree of security, like all locks. The greatest security requires using multiple types of locks together. In Copenhagen and Japan, the O-lock is generally used alone; the bikes are insured against theft and the owner must show that they have the key, to demonstrate that the bike was locked. The key can only be removed by locking the lock. In other locations, the O-lock is used along with locking the frame to a secure object, or the O-lock is used alone when the owner is very close by, to prevent ride-off theft. A skirt guard (or coatguard) allows using the bike with normal clothes, for both the main rider and a passenger riding on the back rack. The skirt guard helps enable riding in cold and rain because it allows easy use of a coat, cloak, dress, skirt, scarf, or luggage; winter biking becomes possible in conjunction with wearing more clothing and using a skirtguard and chaincase. It also enables transporting various materials on the rack without getting caught in the spokes. A skirtguard prevents winter or flowing spring clothing from getting caught in the area where many features converge: the back brake, O-lock, and spokes. The skirtguard and O-lock form an integrated system. The O-lock catches clothing, so the skirtguard is needed to compensate. The O-lock passes through a hole in the skirt guard. The traditional, old-fashioned city bike has a solid (opaque) fabric skirt guard, while the contemporary European city bike has a clear plastic guard. Riding in a dress on a bicycle with fully enclosed chain guard. A fully enclosed chain guard or chaincase enables using the bike with normal clothes and no preparation activity, such as wearing trouser clips or rolling up a trouser leg. A full guard prevents oil stains on clothes, and keeps trouser legs from getting caught in the chain or front chainring. While newer designs may use a partial chain guard, the latter still permits the chain to occasionally catch and stain loose trouser legs if not secured. A full chain guard also keeps the drive train (chain and external gears) clean and efficient by excluding water, mud, and grit which could splash onto the chain and front chainring, increase wear, and reduce drivetrain efficiency. To repair a rear flat tire, a fully enclosed chain guard must be partially disassembled to remove the back wheel, or the tire must be repaired in-place without removing the wheel. The fenders are aluminium or plastic, sometimes with a taillight affixed to the bottom of the back fender. The fairly low bottom of the back fender reduces road grime splashing up to a cyclist who is following behind. Integrated fenders designed into the bike provide a clean, safe attachment, and match the bike frame. Enclosed drum brakes or a rear coaster brake are used on most European city bikes, rather than rim brakes. A bike with drum brakes is optimized for stopping in wet weather: in wet weather, drum brakes provide more stopping power and reliability than rim brakes; but in dry weather, less. Enclosed drum brakes require infrequent maintenance, compared to rim brakes or disc brakes, and are more durable than disc brakes, which are exposed. Drum brakes are best suited for slower, moderate use, rather than longer periods of hard downhill braking while carrying a load. Under such heavy braking, drum brakes are reported to sometimes fade, losing stopping power, while rim brakes can overheat the rim and cause a tire blowout. A common model of drum brake is the Shimano Rollerbrake, which includes a mechanism to prevent the drum brake from suddenly catching and grabbing more than intended. Drum brakes are heavier than rim brakes. Transporting a passenger on the back rack, and a child next to the handlebar. A Dutch convention is to carry a passenger on the back rack, the passenger balancing side-saddle. The sturdy rack supports passenger weight, to carry a passenger and sustain a launch without collapsing. A standard strap assembly attaches cleanly to the rack, providing useful transport capability. There are standard notches for a strap assembly with 2 to 4 elastic straps. The rack is integrated into the bike design; the taillight is usually mounted on the back of the rack. Danish bikes are usually equipped with a back rack with a spring-loaded clamp. Tires are puncture-resistant for travelling without a pump and tools to fix a flat tire. Width is normally medium to wide (1.5-1.75 inches; 38–44 mm), providing a balance of speed with durability and cushioning. These are semi-slick road tires with shallow tread, such as Schwalbe Marathon tires. Such tires are faster and quieter than mountain-bike tires, and more durable and reliable than road-racing tires. Reflective bands on the sidewalls make the wheels visible as wheels, not just as small reflectors. This makes the bike more visible from side at night by cars without using reflective clothing and extra lights. Large 28", 700 B or 700 C wheels are typical, providing a smoother ride than 26" wheels. On traditional Dutch city bikes, extremely thick spokes add carrying strength. To discourage theft, the front and back wheels use axle bolts instead of quick-releases. European city bikes are used in bike-friendly areas for short distances with sturdy tires. These features are suited to riding without tools or quick-release wheels. The platform pedals allow use with normal shoes. The saddle is typically moderately broad, softly cushioned, and is often suspended. A non quick-release seat prevents having to lock or remove the seat to prevent theft. These features allow an increase in comfort considering the erect position. Some saddles further have a longitudinal slot, to avoid perineal pressure. Besides avoiding perineal pressure, these slots avoid sit bone pain, and saddle sores. A kickstand is present, and is often dual-leg or a center-stand for stability while the bike is carrying children or a load. Alternately, an adjustable-length kickstand enables parking regardless of the slope and load. A kickstand allows a bicycle to stand in any flat or slope surface without the need of an external stand or support. A bell is standard equipment for bikes in Europe, and is required by law in some European countries, such as Denmark, Poland and Germany. Additional features are available, such as front and rear bicycle reflectors, baskets, child seats and a windshield. In 1997, then President of the United States Bill Clinton was given a European city bike named City Bike One as a memento of his visit to Copenhagen, Denmark. Other examples of utility bicycles for commuting, errands, delivery and general urban transport. Trek Bicycle Corporation, L300 model and other "City/Trekking/Leisure" models. ^ "urban bicycle - Google Patents". www.google.co.uk. Retrieved 2017-07-09. ^ Herlihy, David V (2004). Bicycle: the History. Yale University Press. p. 2. ISBN 0-300-10418-9. Millions of people around the world still rely on their trusty clunkers for cheap and efficient transportation. In fact, the global fleet approaches a billion, with the vast majority circulating in developing countries like Cuba and China where automobiles remain a luxury. ^ a b Century Cycles (January 7, 2016). "Bicycle Types: How to Pick the Best Bike for You, City Bikes". ^ Herlihy, David V (2004). Bicycle: the History. Yale University Press. pp. 169–170. ISBN 0-300-10418-9. ^ Herlihy, David V (2004). Bicycle: the History. Yale University Press. p. 177. ISBN 0-300-10418-9. ^ Herlihy, David V (2004). Bicycle: the History. Yale University Press. p. 309. ISBN 0-300-10418-9. ^ Herlihy, David V (2004). Bicycle: the History. Yale University Press. p. 264. ISBN 0-300-10418-9. ^ Herlihy, David V (2004). Bicycle: the History. Yale University Press. p. 294. ISBN 0-300-10418-9. ^ Herlihy, David V (2004). Bicycle: the History. Yale University Press. p. 315. ISBN 0-300-10418-9. ^ Ballantine, Richard, Richard's 21st Century Bicycle Book, New York: Overlook Press (2001), pp. 32–35. ^ Ballantine, Richard, Richard's 21st Century Bicycle Book, New York: Overlook Press (2001), pp. 32–34: Ballantine writes: "I like [European city bikes] fine — in the Netherlands. Pedaling them up any kind of a hill is hard work." ^ Ballantine, Richard, Richard's 21st Century Bicycle Book, New York: Overlook Press (2001), pp. 244–46. ^ Ballantine, Richard, Richard's 21st Century Bicycle Book, New York: Overlook Press (2001), pp. 32–34. ^ Ballantine, Richard, Richard's 21st Century Bicycle Book, New York: Overlook Press (2001), pp. 245–46. ^ www.sheldonbrown.com, The Golden Age of 3 Speeds – Roadster, Sports or Club? Retrieved 2009-09-25..
^ "Hub of the Matter". Ride on Magazine. Ride on Magazine. Retrieved 29 September 2018. ^ Ballantine, Richard, Richard's 21st Century Bicycle Book, New York: Overlook Press (2001), pp. 154-158: In some less-civilised cities of the world, bicycle locks offer little protection against thieves armed with moving vans, prybars, portable saws, and cutters to remove locks or their attachment points (posts, bike racks, etc.). Even if unsuccessful in stealing the bike, it is not uncommon for thieves to extensively damage or vandalise it, making public parking hazardous. ^ MacBike Amsterdam Safe Cycle Guide, https://www.youtube.com/watch?v=TjNNDPXVvT0, depicts a ride-off theft at 4:50.